What do you do to reinforce vocabulary you taught your students? Do you find yourself constantly having to repeat definitions? What if its the end of the day & your students have already sat through hours upon hours of lectures? This activity will definitely help you with all of the above! I don't know about you, but I for one am tired of constantly having to repeat the meanings of words that I've already explained a gazillion times before. I prefer to remain sanguine & tai-chi the learning burden onto my students. You will see them desperately racking their brains or pouring through their notes for this activity! Ah... the joys of learning. This is one of my favorite No Prep vocabulary practice activities & it never fails to wake up & engage my students. Students of all ages & levels will enjoy this one. It's a great way for students to revise the vocabulary you've taught them & practice their sentence formation skills too. Try it out & let me know how it went in the comments! Place students into roughly equal-ability groups of no more than 4-6. Give each group a marker. 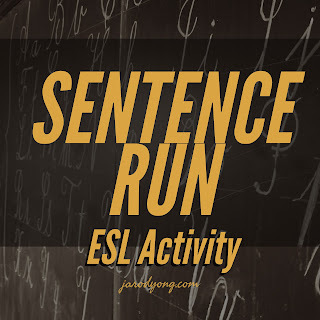 Explain the rules: "I will say one word & you will have to make a sentence with that word.Your sentence must be at least FIVE words long (word-length depends on the level of your students) and make use of prepositions/conjunctions/pronouns/etc (add this secondary criteria only if your students are of high proficiency). You will get 1 point if the sentence is correct. This means that the spelling, grammar, & meaning make sense. You will take turns to write on the board. Only the writer can cross this line. The writer cannot bring a phone or paper, but your teammates can help you verbally." Assign each group a designated space on the whiteboard. Ask the writer from each group to go to their designated spaces. Enunciate a word from the vocabulary list, so they can start writing. Give them roughly 1 minute before counting down & telling them to stop writing. Check the sentences together with the class & award points accordingly. Repeat 4-7 with different writers from the groups. Every student should have a chance to write. After a few rounds, end the activity with higher stakes. Tell them that the last sentence is worth 5 points (this will motivate the losing groups), but use the most difficult word in the list.